Tags for direct thermal and thermal transfer. Thermal labels offer saving ink, but in return more easily deteriorate with exposure to sun, air and the simple passage of time. Because of this deterioration, thermal labels are suitable for products that have a high turnover. Products that will not last long on the shelf or exposure. Trying to extend the duration of the print on the label, we offer two types of labels. Certain tags are marked as TOP or ECO by their manufacturers. ECO are what could be considered normal, and TOP have special protection for a printing even more durable. 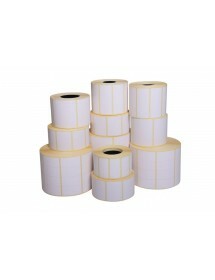 This section includes direct thermal labels, which are heat sensitive, and thermal transfer labels, which use a ribbon. Thermal transfer labels require a transfer, tape or ribbon, available in different materials (wax, resin or mixed) according to the material where will be bonded. You can visit our section transfers / ribbon for more information. This type of printing is optimal for long-term labeling, eg barcodes. Valid for normal and synthetic paper. Direct thermal labels in turn are made of paper that is heat sensitive. To print, heat is applied directly to the paper instead of the ribbon. The characteristics are generally the same as for the heat transfer, but with the disadvantage that the direct thermal printing is more sensitive It's not overly exposed impresses light, heat, humidity and liquids. Recommended for short labeling or products with a high turnover. Usually, you will usually assign a life of one year to printing, but depends on the degree of exposure you have. The market offers a wide variety of printers that can print direct thermal labels, thermal transfer or both. Visit our section label printers to see the printers we recommend to our customers. Tags / labels in matte white for use in direct thermal printing, that is, it is thermal paper which reacts when heated by printer. Outs tags are organized in boxes with several rolls each box. These rolls are already cut with fixed dimensions of the labels. You can print on these labels using one of the label printers that offer on the web, only those who have direct thermal printing.